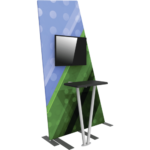 Vector Frame™ double-sided monitor kiosk 01 is a sleek, stylish way to display media at any trade show, event, in a retail or corporate space. 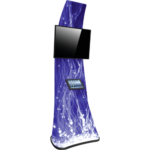 Featuring a single or double-sided printed push-fit fabric graphic, easy to assemble 100mm (4in) aluminum extrusion frame and dual monitor mounts, this kiosk is an ideal multimedia display solution. Pair with a complementary Vector Frame banner, backwall, exhibit kit or counter for a complete solution. 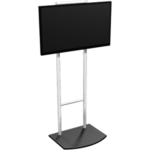 Vector Frame™ single-sided monitor kiosk 02 is a sleek, stylish way to display media at any trade show, event, in a retail or corporate space. 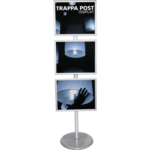 Featuring a single or double-sided printed push-fit fabric graphic, easy to assemble 100mm (4in) aluminum extrusion frame and a single monitor mount, this kiosk is an ideal multimedia display solution. Pair with a complementary Vector Frame banner, backwall, exhibit kit or counter for a complete solution. Truss Kiosk 06 is the perfect way to display media and/or literature at any tradeshow, event, and in retail or corporate spaces. 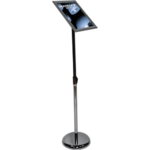 Kiosk 06 features an Orbital Express multi-media kit that can support a tablet or a 23in monitor. 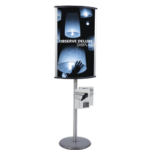 The kiosk is accented by two magnetic rigid graphics for additional messaging space. Assembly is simple, and the sturdy truss frame and thermoformed base and tabletop complement the Orbital Express Truss line of 10ft, 20ft and 20ft x 20ft displays. Tablet and monitor not included. 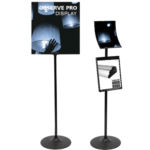 Orbital Express™ Kiosk 01 is the perfect way to display media at any tradeshow, event, and in retail or corporate spaces. Kiosk 01 features a monitor mount that can support a 23in monitor, and is finished with a rigid PVC graphic for additional messaging space. Assembly is simple, and the sturdy truss frame and thermoformed base complement the Orbital Express Truss line of 10ft, 20ft and 20ft x 20ft displays. Monitor is not included. Easily display a graphic or message with a versatile and easy-to-assemble sign stand. 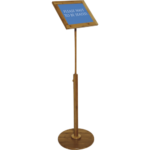 The new Accolade premium bamboo sign holder displays 8.5″ x 11″ paper and can be used in portrait and landscape configurations. Comes with a canvas carry bag. 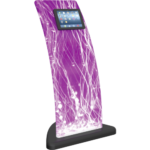 The Vibe™ monitor kiosk is an excellent stand along multimedia display and can also be added to a multitude of exhibit backwalls for additional functionality and meda presentations. 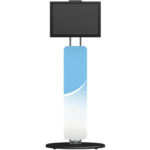 The tube frame assembles easily with snap buttons/spigot connectors and can support a medium monitor up to 40″ in size and 50 lbs. 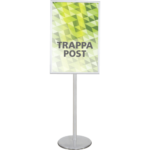 Easily display a graphic or message with this versatile and easy-to-assemble sign stand. 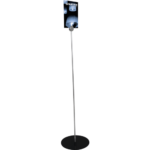 The new Accolaim telescopic post is a modern aluminum swiveling sign holder with a brushed silver holder post and square base. 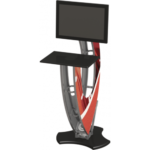 The Freestanding Monitor Kiosk is a perfect accent to any trade show or event display, and is ideal for integrating digital messaging. 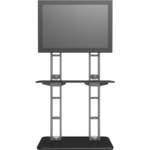 The durable base and split support arms and your choice of a medium or large monitor mount can hold monitors up to 40 lbs and 32″ – 65″ in size, and can be adjusted to the perfect height. 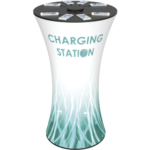 The Formulate® Charging Tower adds technology and great value for visitors in need of a quick charge. 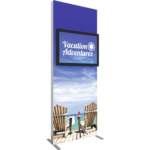 Excellent for retail environments, events and tradeshows alike. 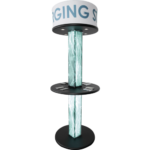 The charging tower features 16 charging tips – eight Android® and eight Apple®, as well as zippered backlit fabric graphics and a thermoform counter top and base. 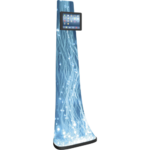 The Charging Tower is ideal for retail applications, trade shows and events. 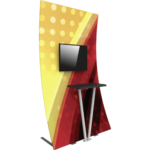 Vector Frame™ double-sided monitor kiosk 02 is a sleek, stylish way to display media at any trade show, event, in a retail or corporate space. 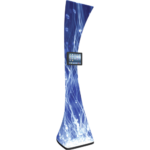 Featuring a single or double-sided printed push-fit fabric graphic, easy to assemble 100mm (4in) aluminum extrusion frame and a single monitor mount, this kiosk is an ideal multimedia display solution. 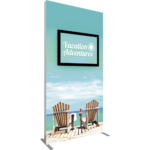 Pair with a complementary Vector Frame banner, backwall, exhibit kit or counter for a complete solution. Truss Kiosk 02 is the perfect way to display media and/or literature at any tradeshow, event, and in retail or corporate spaces. Kiosk 02 includes a monitor mount that can support a 70in monitor, and includes a shelf for additional display space. Assembly is simple, and the sturdy truss frame and thermoformed base complement the Orbital Express Truss line of 10ft, 20ft and 20ft x 20ft displays. Monitor is not included. 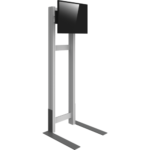 Vector Frame™ single-sided monitor kiosk 01 is a sleek, stylish way to display media at any trade show, event, in a retail or corporate space. 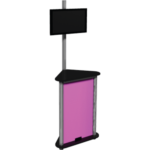 Featuring a single or double-sided printed push-fit fabric graphic, easy to assemble 100mm (4in) aluminum extrusion frame and a single monitor mount, this kiosk is an ideal multimedia display solution. Pair with a complementary Vector Frame banner, backwall, exhibit kit or counter for a complete solution. 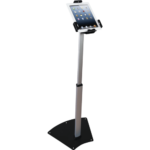 Kiosks, Ipad Stands, and more! 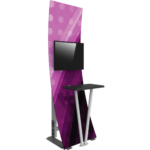 Kiosks are a staple part of any professional trade show booth. 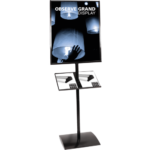 These small pieces of trade show furniture usually stand as a call to action that grabs the viewer’s attention which draws them in to learn more. 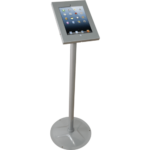 Whether it be a small ipad stand, or a fully fledged kiosk with a built in display, we have it all! 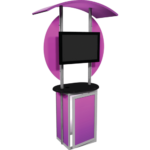 All of our custom kiosks can be made to suit your brand’s needs. All kiosks come with graphic templates that make the design process simple. Your kiosk graphic artwork may be emailed to us for our graphic and print designers. They will call you should any concerns arise and all kiosks are handled with the utmost of care. Our customer service team can help you with ideas on the best display features we’ve seen in our long years of experience. 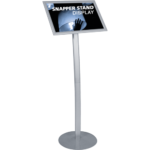 Make the most of it with inexpensive, portable displays today! How durable are your kiosks? 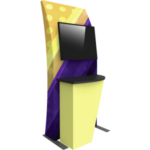 Do you offer Graphic Design services for your kiosks? Generally speaking, we do not offer graphic design for our kiosks. For possible inquiries, please contact our customer service team. For larger kiosks and wall graphics we will offer an hourly rate for any design services needed. For graphic design templates, please see the product page for the kiosk you are interested in and download the design specifications. We suggest all banner stand design files to be at least 300 dpi in resolution for optimal printing resolution.